After spending time at my computer working on a new coil design, I then moved it forward to my shop, and as you see here, the coil is taking shape. Just so you know, I build my monobander coil forms from Delrin®, and both the black as well as white Delrin® are RF transparent, although the white is more RF transparent than the black Delrin® above 1 GHz in frequency. In case you were wondering what the holes in this black Delrin® coil form are for, its to keep the coil assembly as light as possible, for when it becomes part of the antenna assembly. And besides, it makes the coil form more aesthetically pleasing, which for me is an important part of how I design and build anything. 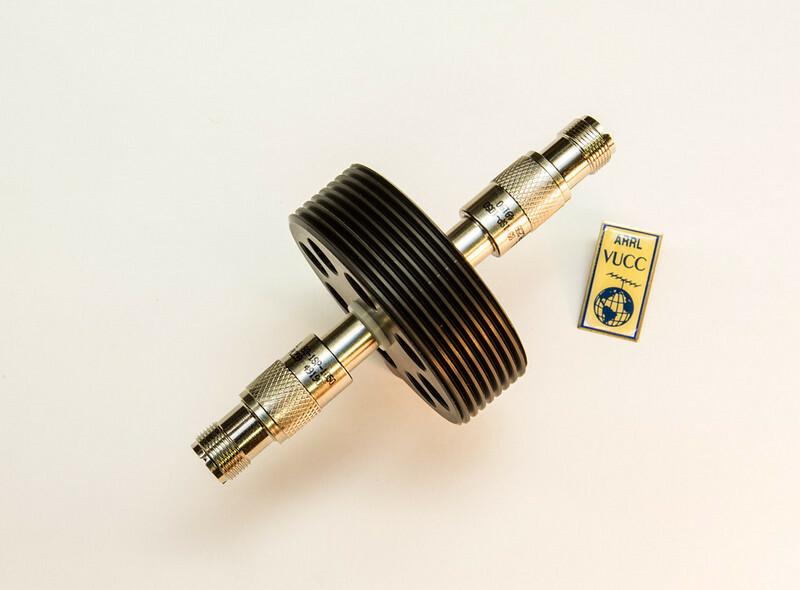 What is the band and the dimensions of the coil shown in the photo you ask... well my ARRL VUCC pin (On Satellite) measures 3/4" X 1 1/2", so if you guessed the diameter at around 3 inches, you would be spot on. This coil assembly is for the 17 meter band. Well...I had better finish with the building of this coil assembly if I am going to work some DX with it.